I was really excited about sitting down and testing this SiS 648 based motherboard. From what I've read the SiS 648 chipset is supposed to be a full-blown i850E/RDRAM killer and I really wanted to test this out first hand! Since I've just upgraded my home system to a P4 using the i850/RDRAM this was news I really didn't want to hear, especially considering all the good DDR I have lying around. As we mentioned in the PCstats.com review of the ECS AG400 (Xabre400), SiS are really in the chipset spotlight right now. Like VIA a few years back, it seems that every chipset that is coming out from SiS is a hit. It started with the SiS 735 chipset for the Athlon if you recall. When the SiS 735 was released it was easily the most powerful AMD/DDR chipset around, and even caused VIA (SiS's arch rival) to revise their KT266 chipset for better performance! From evidence online, SiS's new 648 has potential to be one of the most powerful P4 chipsets around! In the usual MSI fashion, when new a chipset comes out they are quick to adopt it. 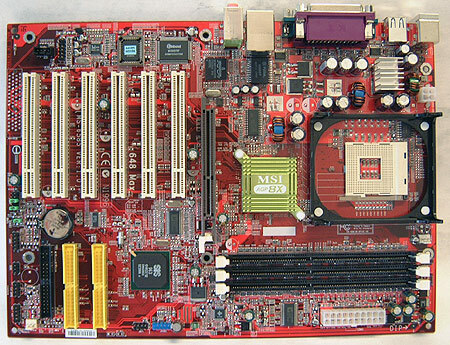 The MSI 648 MAX-F supports Pentium4 processors in the Socket m478 form factor which run at either 400 MHz or 533 MHz FSB (Front Side Bus). In terms of feature the motherboard has onboard 5.1 audio albeit from the AC-97 codec; 8X AGP , Gigabit LAN (10/100/1000), six USB ports (four rear, two USB 2.0), six PCI slots, and three DIMM's that support upto 3GB of PC1600/PC2100/PC2700 officially and PC3200 (DDR400)... unofficially that is! The SiS 693 Southbridge supports UDMA133 as well, but not IDE RAID is not an option here. Like most other MSI boards, the 648 MAX-F comes in a shade of bright red PCB (which will appeal to style conscious case modders). 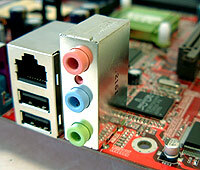 The ATX board is really very expandable with no less than six PCI slots - you shouldn't have any problems adding in extra soundcards, or PCI peripherals. To quell our ever increasing thirst for speed and bandwidth, MSI have taken the liberty of adding onboard Gigabit LAN (10/100/1000!) care of the Broadcom BCM5702CKFB BGA controller. While Gigabit LAN's are not just yet widespread in the home level right now, its a really nice bit of future proofing to have. And hey, if you happen to have a Gigabit connection to your switch you are sitting pretty! The Broadcom specsheets incidentally list this controller as "server class reliability" but testing that claim out is beyond the scope of this review. The Broadcom BCM5702CKFB controller is a fully integrated 32-bit 10/100/1000BASE-T Gigabit Ethernet Media Access Control and Physical Layer Transceiver solution. 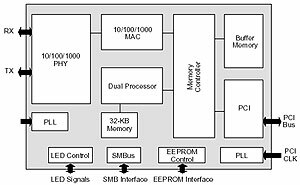 The BCM5702 combines PCI bus interfaces, on-chip buffer memory, and integrated physical layer transceiver (PHY) in a single device. Based on a low-voltage 0.13um CMOS process, the single BGA chipset is reportedly fine for use in zero-airflow environments. The BCM5702 supports with full/half-duplex capability at all speeds, and includes an on-chip power circuit controller, WOL, and CPU task off load capability. Windows 98/NT/2000/XP and Linux 2.2/2.4 are the supported OS's.